Last week I heard a rabbi speaking on how Israel is God’s chosen people. Well, of course, we’ve all heard that time and again. Okay, so you’ve heard it before. But, what does it mean? Does it mean that they are special? Does it mean that they are set apart? Does it mean that they get something nobody else does? Maybe it does. Maybe Israel is a group of people who God destined for something beyond anybody else’s imaginations. The thing is that it wasn’t the chosen-ness of the Israelite people that struck me. It was what he was saying they were chosen for. He was talking about how they were chosen to keep the Word of God. He said they were chosen to work for God. Yes, they were chosen for blessing, but he did not see that as the prime thing they were chosen for. He spoke about how the Jews were chosen to make many angry. And to him the blessing was found in the opportunity to light the way to God for others. Right away my mind jumped to 1Peter 2:9-10 (But you are a chosen generation, a royal priesthood, a holy nation, His own special people, that you may proclaim the praises of Him who called you out of darkness into His marvelous light; who once were not a people but are now the people of God, who had not obtained mercy but now have obtained mercy.) which I have often prayed over my own life. This scripture is so ingrained in me that I created a tattoo for my husband’s arm as a sign of the mark of God on his life (X marks the spot) – being chosen by Him. When the words this rabbi spoke clicked in my mind I reread these verses with a different emphasis. I know I have slightly thought about it from this angle before, but I don’t think I thought about it in quite this light. This scripture is about all of us being chosen by God because of Jesus. Through Him we are all chosen. We were chosen by mercy for a PURPOSE. And the purpose – to proclaim the praise of YAHWEH. And therefore we were chosen for rejection, to be discredited, put down and thrown out. It does not say we were chosen to be specially blessed (and yet He does bless us in extraordinary ways.) It does not say that we were chosen to have an easy life. It says we were chosen to PRAISE regardless of the circumstances of life. This is the eucharisteo. This is what we give thanks for. We give thanks that we were chosen to be persecuted. We give thanks that we were chosen to be different. We give thanks that we were chosen to stand out and in standing out be transparent before others that they may see through us directly to God. In other words we were chosen to be invisible. We were chosen to be hated and ridiculed. Isn’t it a beautiful thing? We have been chosen to be all the things we would normally want to avoid. And also, we have been chosen to be royal, holy, special, called out of darkness, made into the people of God and we have obtained mercy. Truly, I do not believe that there is anything more I could ask for. I praise the Lord. With all that is within me I praise the Lord. When I rise in the morning I reflect on His mercies and I praise Him for this gift. As I live and breathe, my breath shall be YAHWEH. When circumstances come against me, I will lift my eyes and give thanks. When I am persecuted, ridiculed and put down I will not be discouraged; instead I will delight myself in Him who is well able to and willing to be my all in all. When I walk through the valley of the shadow of death, I will fear not evil for I am not alone. I am comforted in Him. He makes all things new, even me. Praise the Lord! Praise the Lord! 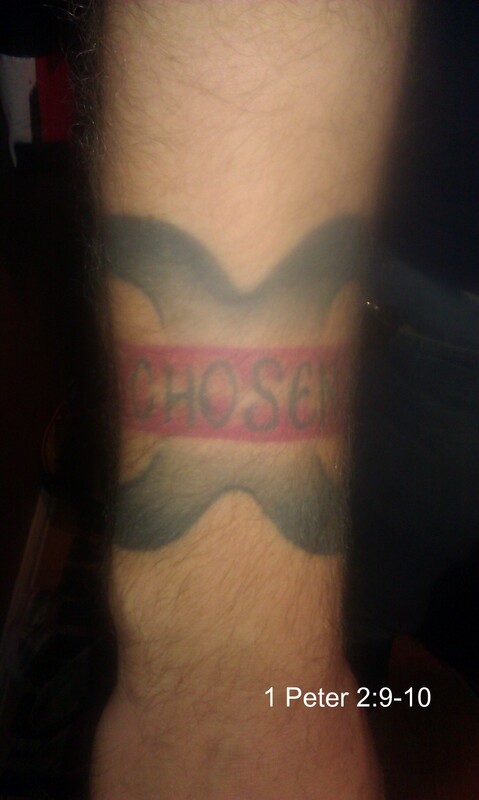 I am chosen by Him.